They say that something as neat and pure as water can also be intoxicating, if overindulged in. But overindulgence is an extremely farfetched word when it comes to these exorbitantly priced bottled water!Bottled water could be of different types- well, distilled, and mineral or purified water. It can also be collected from rain or spring. Water is even flavored nowadays. These added flavors make the water costlier.However, some can get extremely over-priced being exotic and instead of sating your thirst, burn a hole in your pocket! 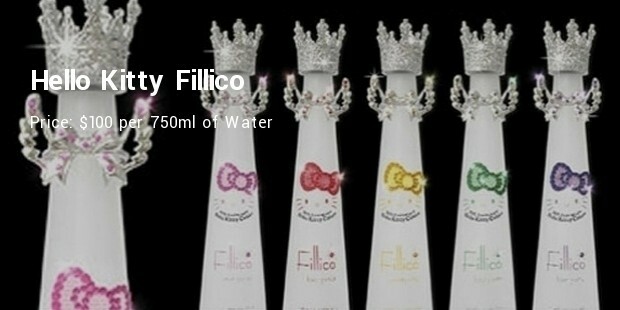 The list presents to you the top most‘luxurious’ bottled waters on earth! 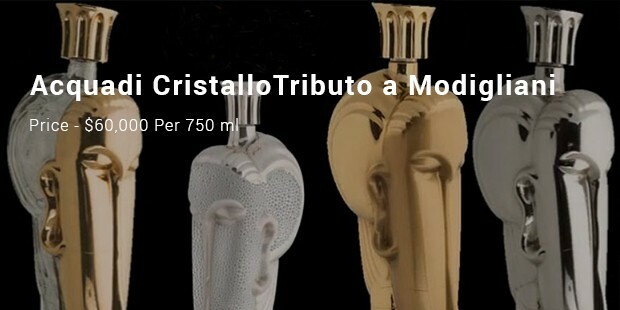 At $60,000 per 750 ml, Acqua di Cristallo Tributo a Modigliani, is the most expensive. Bottled in solid gold, it weighs 24 karats. Its designer Fernando Altamirano of Tequila Ley fame, is also credited as the creator of one of the most exclusive spirits. It also has different versions in matte- gold and silver, silver, etc. Presented in leather bags, it also has 5 milligrams of gold dust! 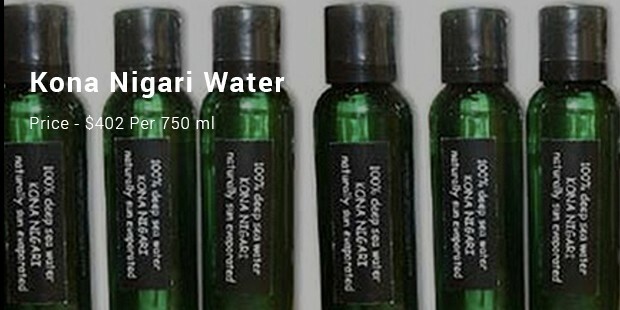 The Kona Nigari is manufactured and sold in Japan. It is marketed as a remedy to the problem of obesity and also a stress buster. It is also being advertised as a skin enhancer and toner. It is prepared with distilled sea water, in a part slightly away from the Hawaii Island. These bottles are designed like a chess piece. They, especially, are modelled like the royal pieces, that is, that of the king or queen. The association with royalty is easily understandable then. On top of it all, the Fillico bottles are crowned with pure gold. This ‘royal’ bottled water is a product of Osaka, Japan. 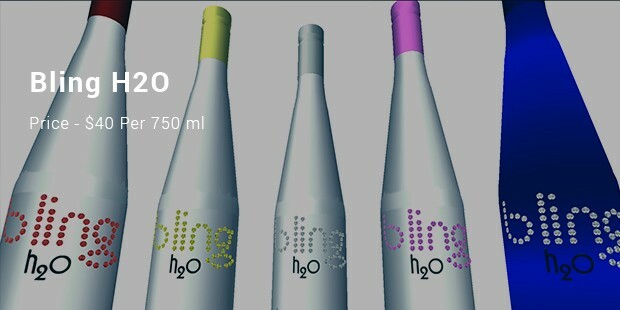 Bling H2O is the most eco-friendly bottle of water. It was an inspiration of Kevin G Boyd, Hollywood writer- producer, who while working in studio would use this water to drink. Many Hollywood celebrities use this water bottle during shoots. This has certainly made this bottle the worth using. 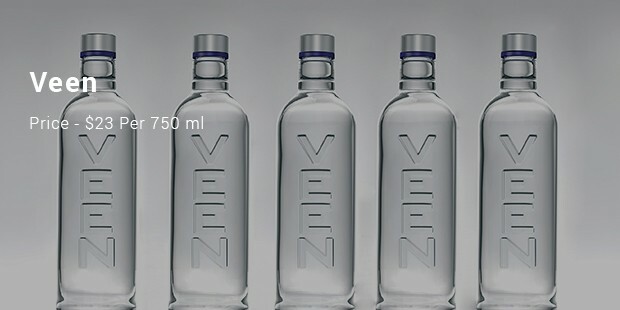 This Finnish brand is the most expensive bottle for water and is available in 0.33L and 0.66L/0.69L glass bottles in still and carbonated editions. The name of this brand comes from Veen Emonen and is introduced by Finnish National epic Kalevala. This glacier water comes from melted glacier ice. The source is located in the pristine Coastal Glacier Range in British Columbia. 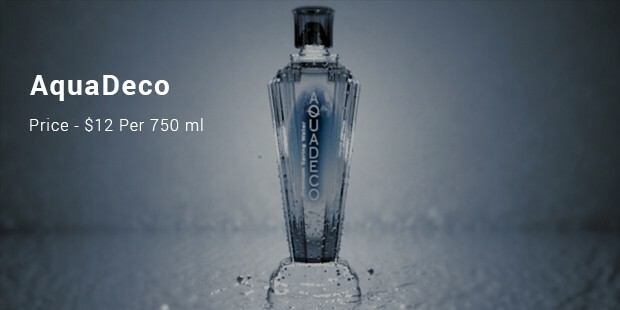 The product comes with rich classic design that complements to the entire look of the bottle. 10 Thousand BC was served in many events. It is being supplied by aquifer and was created on glacial till predominantly sandy silt matrix. 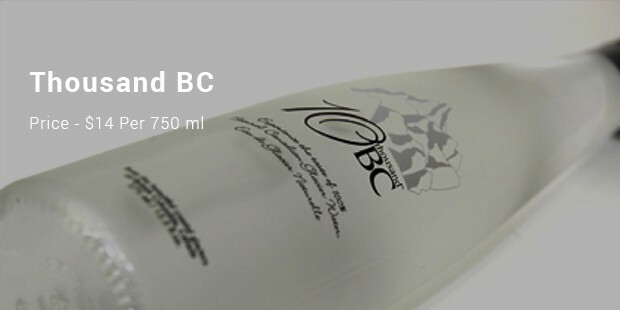 The bottle water comes with the composition of overlaying soils and high quality water. It comes with an attractive bottle shape and expensive price tag. 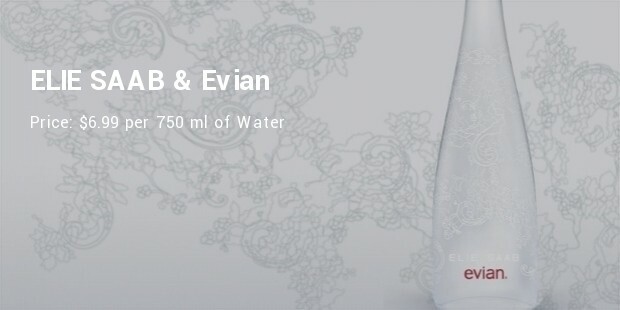 The bottle was created by Lebanese fashion designer Elie Saab and is an expensive luxury mineral water bottle. This bottle comes with signature Elie Saab Lace pattern, and recalls the feminine and elegant designs. It comes with an elegant shape that allures to buy. This bottle water comes from Tasmania and was launched in United States in 2009. As Tasmania is known for its cleanest air, the place offers clean water source. 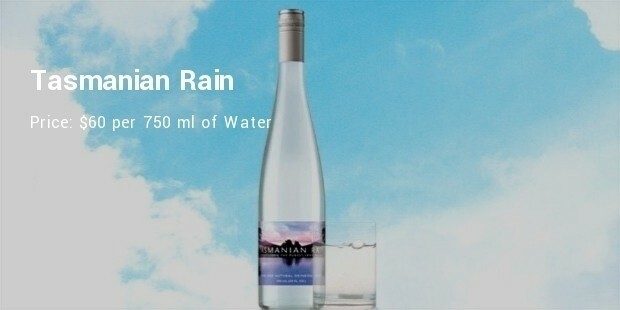 Tasmanian Rain water bottle comes with an appealing design and expensive price tag. 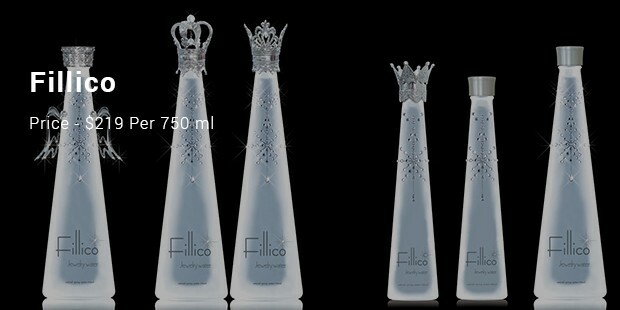 This fantastically designed bottle of water is specially designed for ladies. The bottle comes with cutesy cat mug which makes it look cute. The product comes in five different colors- Pink for cute, yellow for heartful, green for wish and lavender for sweet. Along with impressive bottle, it also comes with pricy tag. Man’s “thirst” is quenched at a high price, or is it? People all over the world are facing great difficulties due to scarcity of pure water. In such situations, bottled water is the only solution. These bottled water are, however, extremely costly because of their exotic sources, design of the bottles, material used etc. But extravagance comes with a price tag.